A number of global leaders, including the pope, have expressed their hope for the success of the upcoming summit between South Korean President Moon Jae-in and North Korean leader Kim Jong-un, Moon's presidential office Cheong Wa Dae said Wednesday. The global leaders include German Chancellor Angela Merkel, who called the upcoming summit a "glimmer of hope." "Now I call this a glimmer of hope. It must continue to work. But of course it would be wonderful if we could reduce tension here. Because it was a big concern for all of us -- this tension due to the nuclearization of North Korea," the German leader said in a press conference held March 9. On March 5, Seoul and Pyongyang agreed to hold the Moon-Kim summit when Moon's top security adviser Chung Eui-yong traveled to Pyongyang for an unprecedented meeting with the North Korean leader. There, Kim also proposed holding a separate summit with US President Donald Trump, who later said the first US-North Korea summit ever will likely be held in May or early June. 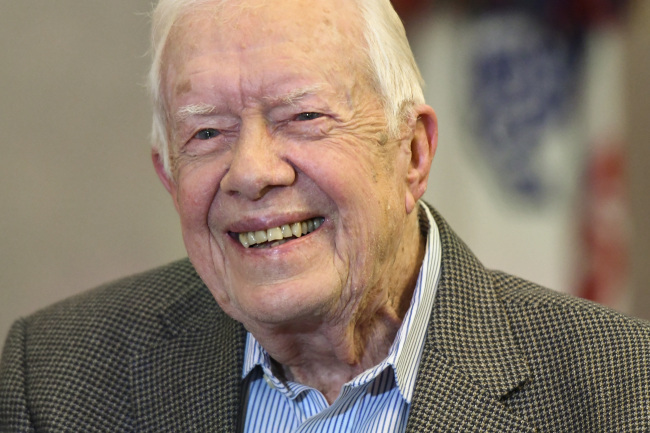 The latest well-wish came from former US President Jimmy Carter, who on Tuesday tweeted, "As the leaders of South and North Korea prepare for their Peace Summit on April 27, I offer my prayers and best wishes for a successful meeting that will bring a permanent peace to the Koreas and their neighbors," Cheong Wa Dae said in a press release. The Moon-Kim summit will be held Friday on the South Korean side of the border village of Panmunjom, which will make Kim the first North Korean leader since the end of the 1950-53 Korean War to have stepped on South Korean soil. The meeting will mark the third inter-Korean summit. Pope Francis urged efforts on all sides to make the dialogue work. "We implore fruits of dialogue for the Korean peninsula, that the discussions under way may advance harmony and peace within the region. May those who are directly responsible act with wisdom and discernment to promote the good of the Korean people and to build relationships of trust within the international community," he was quoted as saying in a message released April 1 to mark Easter.